Wall Street had mixed reactions to Microsoft’s surprise announcement on Monday that it would buy LinkedIn for $26.2 billion. One firm, Jefferies, titled its instant analysis about the deal, “Large Acquisition, Large Valuation, Large Risk,” and compared it with past Microsoft acquisitions Skype, Nokia, and aQuantive. 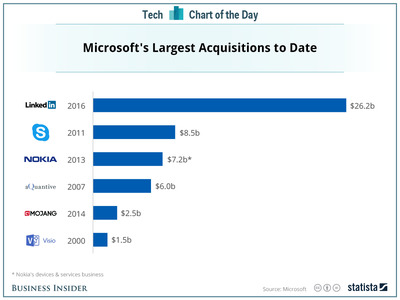 “Most would categorise at least two of those three prior acquisitions as missteps, and the third is difficult to assess given the Skype brand expansion within Microsoft,” wrote Jefferies.